Fornells: welcome to a magical place. 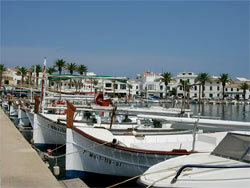 Fornells is like a pearl nested into the virginal north coast of Menorca. A truly beautiful harbour that surprises all those who visit it. This traditional town of fishermen has become a major reference thanks to its outstanding fish restaurants and an unparalleled variety of nautical sports that can be practiced in the shelter of its bay. In their white-washed houses, the inhabitants of Fornells have always kept a calm life of respect with nature. This spirit persists nowadays. Here we live far from the large from large hotel complexes and those who visit us soon will soon recognise the affection that is felt for this authentic place. 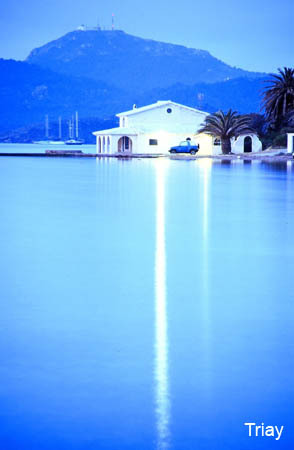 The second colour of Fornells after white is blue - you will find it in the calm and crystalline waters of its harbour. It is not in vain that the area extending from the port to Cap Gros and until Punta des Morter has been officially declared as 'Marine Reservation Area'. The bay of Fornells contains four pretty virgin coves and three small islands in which the 'S'argantana Balear' - an endemic species of lizard - can be found. The coves and islands can only be reached by boat. The salt mines that can be found in the shallow waters at the end of the bay come to complete this top-notch ecological and landscape setting. Thanks to the protection of the narrow mouth of the harbour to the sea, the 5 kms. of length of the bay and the 2 kms. of width, marine sports activities have a privileged place in Fornells. In its calm waters you can practice windsurf, saling, kayak and diving. The wind is usually moderate and sufficient for surfres, divers will find plenty of life at the bottom of the sea and those on their kayaks will be delighted by the unspoiled coves and the wild beauty of the coast. 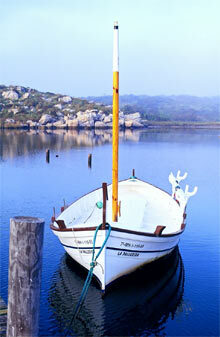 By land, the northern part of Menorca offers many activities for those interested in hiking and adventure sports. Horse riding, cycling, mountain-bike and golf are only a part of the terrestral activities available in the Fornells area. There is a good selection of professionals to supply you with training and equipment in our location: please check out our section on sports in Fornells for more information. If you want to rest, eat well and enjoy some days of peace and harmony with your loved ones, Fornells won´t let you down. In the month of July we celebrate the 'festes' - the municipal fiestas. On one hand there is the 'Mare de Deu del Carme', the patron of the fishermen, which is celebrated on the 16th of July . At the end of the month, Fornells celebrates the patronal fiestas of 'Sant Antoni' during which a strict protocol is observed that is loyal to very old traditions. The most spectacular part of the fiestas is the 'jaleo' during which the riders make their beautiful horses jump to the rythm of the music and where everyone is invited to participate. Menorca has a very pleasant temperature during the greatest part of the year with a typically mediterranean climate. The summers are dry and hot. The winter is soft but wet. The cool norther wind, called 'tramuntana', characterizes the menorcan landscape.